The new album, Heartbreak Pass, by seminal erosion-rock band GIANT³ SAND, marks their 30th anniversary. Individually, each track on the record looms large on its own but, when heard as one complete offering, you know that you are listening to something very, very special. The Arizona desert has long been a source of inspired minimalism for Howe Gelb, the indie rock pioneer and frontman. The album also features Jason Lytle (Grandaddy), John Parish (PJ Harvey), Steve Shelley (Sonic Youth), Grant-Lee Phillips (Grant-Lee Buffalo), Ilse DeLange + JB Meijers, ('The Common Linnets' Netherlands), Sacri Cuori (Italy) and Lovely Quinces (Croatia). Fire’s recent reissue of his fine, gospel flavoured ’Sno Angel Like You served to remind us of the range of the former Giant Sand frontman’s talents. Despite his country roots, Gelb seems at his best when going against the grain and defying expectations. As the title implies, this time around Gelb is ambitiously bidding to add to the Great American Songbook with a jazz-flecked collection of wry, wee small hours ditties. These are tunes that often hinge upon a cute turn of phrase (see Impossible Thing’s “You might as well put screen doors on submarines”) and sound as if they could conceivably have been recorded live in a smoky basement – all brushed drums, fidgety stand-up bass and jazzy, tastefully employed piano. Still, this would be fairly unattractive if it was a mere genre exercise. Rather, Gelb’s melodic dexterity and wicked way with words makes for an enormously appealing album – think the Tom Waits of The Heart Of Saturday Night encouraging Cole Porter to bunk off and spend the afternoon shooting craps and gargling bourbon. It’s a pleasingly consistent collection of songs, but special mention goes to the raunchy Relevant (complete with solos for Reinhardt-like guitar and swaggering piano) and May You Never Fall In Love’s wordly advice. All said, it’s a good look on him. 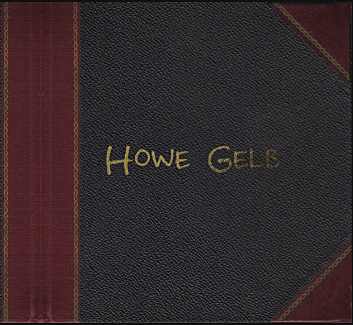 In February 2016, Howe Gelb made the surprising announcement that he was retiring his longtime project Giant Sand, and while he didn't offer specifics about what he was going to do next, he did end his statement with the words, "Piano for now. Songs forever." Those five words turned out to be an excellent summation of Future Standards, an album that Gelb issued roughly ten months later. Future Standards finds the great Arizona surrealist transforming himself into an alternate world version of Frank Sinatra, singing his own brand of saloon songs suitable for a late night and a glass of good bourbon. Most of Future Standards features Gelb accompanied by piano, bass, and drums, and the melodies pay unironic tribute to the graceful jazz-influenced pop sounds of the '40s and '50s. This is music meant for a cabaret or a piano lounge, not a rock club, and Gelb not only plays it straight, he sounds comfortable and playfully sly as he croons over his piano work, which manages to embrace the melodies while toying with them at the same time, while the drummer stirs the soup and the bassist gently tends to the low end. While this sounds very little like Giant Sand, this is very much a Howe Gelb album; the lyrics, most dealing with affairs of the heart, are gentler than many of his best known works, but there's still an edge of purposeful eccentricity that's authentically his in tunes like "May You Never Fall in Love," "Terribly So," and "Mad Man at Large." And the occasional vocal interjections of Lonna Kelley add a romantic touch while maintaining an off-kilter feel that serves this music remarkably well. Future Standards isn't quite "Howe Gelb, the Moonlight, and You," but it's closer than anyone might expect, and he plays lounge lizard here entirely on his own terms, and it's a thoroughly enjoyable detour for a multi-faceted artist. Despite the breadth of it, Heartbreak Pass isn’t sprawling. It’s an impressive show of strength and act of endurance.. .